On to the first review! 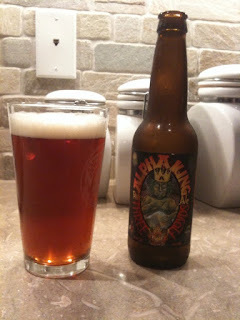 The first review is for their Alpha King! This is their standard bearer of their mass production offering. I found it on tap in many places around Chicago. Unfortunately you can't get it in the Pacific Northwest at Any price. It has a golden brown color that is a little lighter than say an Amber. It has a thick foamy head and the hoppy smell wafts out of the bottle at you immediately. It is the defining point of this beer. It is so floral and sweet without being sugary or overly malty. This is special. It's as if the malt hits the front of your tongue at the exact instant that the hops hit the back of your tongue. The precision is amazing. It's a hoppy beer that are tempered by the malt slightly but really the hops themselves are a beautiful thing. And the best part is the finish. This finish lingers. And I mean I can take a drink. Eat a piece of my wife's chicken parmigian and still taste the beautiful hops on the back of my tongue. I've been writing for a couple minutes now and STILL can taste the hops on my tongue! -Beautiful Hop aromas and flavors that last and last. -The last beer you may ever taste! -The True King of Beer!